Took a lot of photos on this day and everyone of Sigafoos doing a Madonna or lein to tail he always had his middle finger sticking out on his truck…too cool. That is Team Steam rider Rocky Vertone with the pink helmet. Here are some links to Ken’s website, Extinction Skateboards (which has Sigafoos boards for sale) and a cool piece someone wrote about Ken I stumbled upon the interwebness thingy. This entry was posted in 1987, Ken Sigafoos, Photos by Jason Oliva, SPOTS:, TEAM STEAM, The Slug Ramp and tagged 1987, ART, backyard ramps, east coast, jason, Jason oliva, jasonoliva, New Jersey, New York City, oliva, paintings, Pennsylvania, pool Skating, ramp, ride, sk8, sk8t, skate, skate history, skate photography, Skate ramps, skateboarding, skateboarding history, skateboarding photography, skateboards, skatepark, skater, SKATERS, steam, Street Skating, TEAM STEAM, The Barn, The House of Steam, thos, vert, vert ramps on October 2, 2006 by jasonoliva. I created a series (14 or 15 in all) of Team Steam Trading cards (they are actually stickers) in our High Schools graphic arts department in 1987. They are as big as a baseball card and almost every member at the time had one, including the Barn itself and The Raging Lamos. Special thanks goes to Mr. Abella our Graphics teacher for letting me hog the printing press all the time and floating us copious amounts of sticker paper. Mr Abella was the most skate friendly adult the world had seen at the time. This entry was posted in 1987, Dan Tag, Jason oliva, SPOTS:, TEAM STEAM, The Slug Ramp and tagged ART, backyard ramps, barn, Bernie O'Dowd, Dan Tag, jason, Jason oliva, jasonoliva, John Ballon, Maryland, New Jersey, New York City, Ocean City, oliva, paintings, Pennsylvania, Power Edge, ramp, ride, sk8, skate, Skate ramps, skateboard magazine, skateboards, skatepark, skater, steam cards, Steel ramp, Street Skating, Tag, TEAM STEAM, The Barn on September 17, 2006 by jasonoliva. You could ride her by night…. She came in two colors! Anyone want to write a history of The Slug feel free to email me or leave it as a comment…all I will say on the subject is as far as ramps go she was BYOOT! …thanks for the pics Dan! Keep em coming! This entry was posted in DJ VertOne, four 4, Geoff Graham, Photos by Ben Cornish, photos by Dan Wilkes, Photos by Jason Oliva, Rocky Vertone, TEAM STEAM, The Slug Ramp and tagged ART, backyard ramps, barn, jason, Jason oliva, jasonoliva, New Jersey, Night Session, oliva, pA, paintings, Pennsylvania, ramp, ride, sk8, skate, Skate ramps, skateboards, skatepark, skater, Street Skating, TEAM STEAM, The Barn on September 9, 2006 by jasonoliva. Met “Corn” in highschool he showed me which end of the camera to look in and we have been friends ever since. Team Steam skated the Slug ramp all year around… at night and in the snow(snow session photo’s coming soon) nothing short of a broken down automobile ever stopped us from riding it. 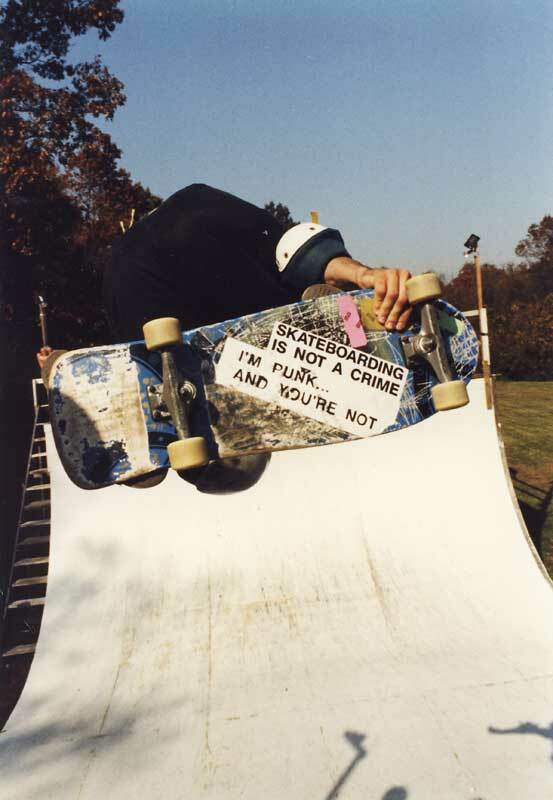 This entry was posted in 1986, Ben Cornish, Photos by Jason Oliva, TEAM STEAM, The Slug Ramp and tagged ART, backyard ramps, barn, jason, Jason oliva, jasonoliva, New Jersey, Night Session, oliva, paintings, Pennsylvania, ramp, ride, sk8, skate, Skate ramps, skateboards, skatepark, skater, Street Skating, TEAM STEAM, The Barn on September 9, 2006 by jasonoliva. This entry was posted in Photos by Jason Oliva, Rick Charnoski, TEAM STEAM, The Slug Ramp and tagged backyard ramps, barn, Bernie O'Dowd, deathbowl, diy, independent, jason, Jason oliva, jasonoliva, New Jersey, NPC FILMS, old school, oliva, ramp, Rick Charnoski, ride, sixstair, sk8, skate, skate decks, skate films, Skate ramps, skateboards, skatepark, skater, steamboat, Street Skating, TEAM STEAM, The Barn, underground, vert on August 11, 2006 by jasonoliva. This entry was posted in 1988, Jason oliva, Photos by Ben Cornish, The Slug Ramp and tagged ART, backyard ramps, barn, Bernie O'Dowd, jason, Jason oliva, jasonoliva, New Jersey, Night Session, oliva, pA, Pennsylvania, ramp, ride, sk8, skate, Skate ramps, skateboards, skatepark, skater, slug ramp, Street Skating, TEAM STEAM, The Barn, vert on August 11, 2006 by jasonoliva.